Northlink College’s Lee Anne Andrew started the National Certificate (Vocational) NC(V) Programme in 2008. She schooled and lives in Mitchell’s Plain in the Southern Suburbs of Cape Town. 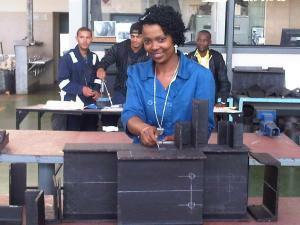 Lee Anne is the first female qualified Boilermaker in the FET College Sector. At the time she entered the Boilermaking Programme at Northlink, the roll-out of the NC(V) programme was in its teething stage. She recalls that she felt that she had taken an enormous risk with her future in the midst of forming part of the new curriculum and launching of the NC(V) Engineering Fabrication Programme. Andrew and her classmates were often referred to as the foundation class that will set the benchmark for all future boilermakers that the College will produce. In those uncertain days Lee Ann set about honing her skills. With much support from the lecturers and the institution, she plodded on working tirelessly to pass all subjects at each Level. At the end of her course she was able to complete all 21 subjects, most of them with distinctions. In addition to this great achievement it is truly amazing that this young lady also found the time and the energy to head the Student Representative Council (SRC) and with astute leadership, negotiated many critical changes at Northlink to the advantage of her fellow students. Lee Ann professed, “All praise to Mr W. Petersen who assumed a fatherly role in my life, guiding and teaching me to observe the beautiful things that will make for success. Supporting me when things were rough and life looked a bit hazy”. He, without hesitation recommended her to Damen Shipping. She was enrolled as an Apprentice Boilermaker in 2011 and set about making her mark in industry. This industrious, hard working lady excelled in all her challenges least of which was taking up an AUTO CAD course at Northlink under the professional guidance of the accomplished lecturer, Mr M Johnstone. Upon completion of the course she was appointed as a Junior Draughtsperson in the Drawing Office of Damen Shipping where she currently finds herself. Lee Anne completed all the requirements to qualify for a Trade Test in Boilermaking and in May 2013 she came to Northlink College, an accredited Trade Test Centre for Trade Test Preparation. A day before her Trade Test she celebrated her 21st birthday and a few days later she was declared competent in all levels of the Trade Test. “To all the females that will embark on the path of becoming Boilermakers, nothing is impossible, if I can do it then you can do it too. Be the best in this male dominated field and show the men how it should be done”, Lee Anne’s parting advice.